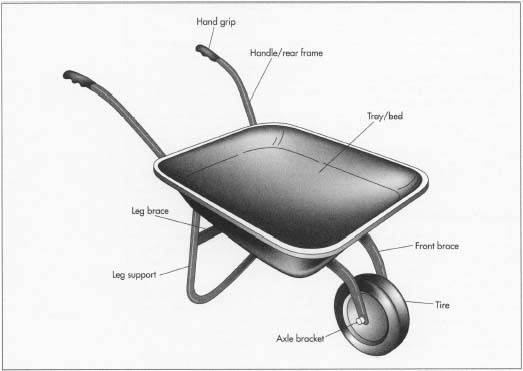 The birthplace of the modern wheelbarrow was China, possibly as early as 100 B.C. One early version consisted of a large single wheel at or near the front of a platform. The load would be placed behind the wheel, and the operator would lift the heavy end and push the load. Sometimes a small basket would be used to carry the load, and if it was heavy, a second operator could pull from the front. Another type, probably invented by Chuko Liang in 300 A.D. , had a carrying surface that was basically a large wheel housing that encased the top half of the wheel. A flat platform projected out from both sides at axle level could then carry large loads, people and goods in pannier fashion while the operator steered it. Loads were higher off the ground than those carried in modern wheelbarrows. Chinese wheelbarrows were hence similar to rickshaws in that the goal was to carry heavy loads long distances. Tseng Min-Hsung in 1200 A.D. boasted that "ways which are as winding as the bowels of a sheep will not defeat it." of air) and heating them with very hot air in a blast furnace. The resulting mixture of iron and carbon is known as pig iron. Oxygen is blasted into molten pig iron to remove most of the carbon. The resulting molten steel is cooled into a variety of shapes.